I have a technology loving family! We all love our electronics, but we don’t all love the same ones! Thankfully, Best Buy has something for everyone on my list! My 3 youngest kids love video games! They’d play for hours if I let them, but I’m one of those mean moms who limits screen time! If you have a gamer in your life, you’ll want to check out the Xbox One. Xbox One was built by gamers, for gamers. They have the best exclusive titles (Halo, Sunset Overdrive), the biggest blockbusters (Assassin’s Creed and Call of Duty) the hottest sports franchises (Madden 15, FIFA 15, NBA 2K15) and top family titles (Fantasia: Music Evolved, Just Dance 15 (I need to get this ordered for my family), Skylanders) Xbox One takes gaming to a whole new level. My 16 year old daughter LOVES music! It’s constantly blasting from her phone, her iPod or whatever radio/stereo she can find. If you have a music lover on your list, check out these great gifts from JBL. The JBL Flip 2 is a great gift for someone who wants to be able to take their calls and listen to music from a portable speaker. Aside from the dual performance-tuned JBL drivers and a built-in bass port, the key benefit of the JBL Flip 2 is the SoundClear echo and noise cancellation combined with the state-of the art microphone system to pick up calls on the speaker. I don’t know of anybody who wouldn’t benefit from a good pair of headphones. The JBL Reflect Earbud headphones have a 5 hour rechargeable battery and a reach of about 40 feet. They have a sweat proof ergonomic design. The best benefit of theJBL Reflect is the design of the ergonomic eartips along with the built-in magnets which keep your buds on standby without loose cables. I feel like I constantly have to wrestle my cables into submission! My 19 year old just moved to Knoxville to go to school. It’s a new town and she needs to be able to get around easily! That’s why she needs a navigation system! Best Buy is a great destination for a Navigation System. They carry TomTom and Garmin systems that feature bluetooth connectivity for hands-free calling, traffic and weather updates. Plus they come with lane assist, lifetime traffic and map updates. They’ve totally come a long way since I bought my first TomTom 10 years ago. They now even have voice recognition technology. Both the Garmin 52LM and theGarmin 2597LMT have a 5.0” display, maps of 49 U.S. states and lifetime map updates. They display speed limit (soooo important) and accurate arrival time. You can get spoken turn-by-turn directions so it’s easy to find addresses and lots of other points of interest. The TomTom Go 50s offers lifetime TomTom traffic for the life of your device. You also get lifetime maps for the US, Canada and Mexico. They now offer 3D maps with makes it easy to see stunning details of landmarks and building. What are you waiting for? 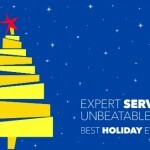 Head to Best Buy to take care of all your gifts for your tech loving family!